Forest Cafe is just down the road from The Edinburgh School of Art. We hung the exhibit after driving up from Suffolk. It took about an hour, including a foray to a bargain store to buy more suction hooks. (thanks Hudson and Patrick)! We had lots of interest, with people taking photos, asking questions and wanting to get involved. I talked with one visitor who found the idea of ownership quite an interesting aspect of the exhibition. 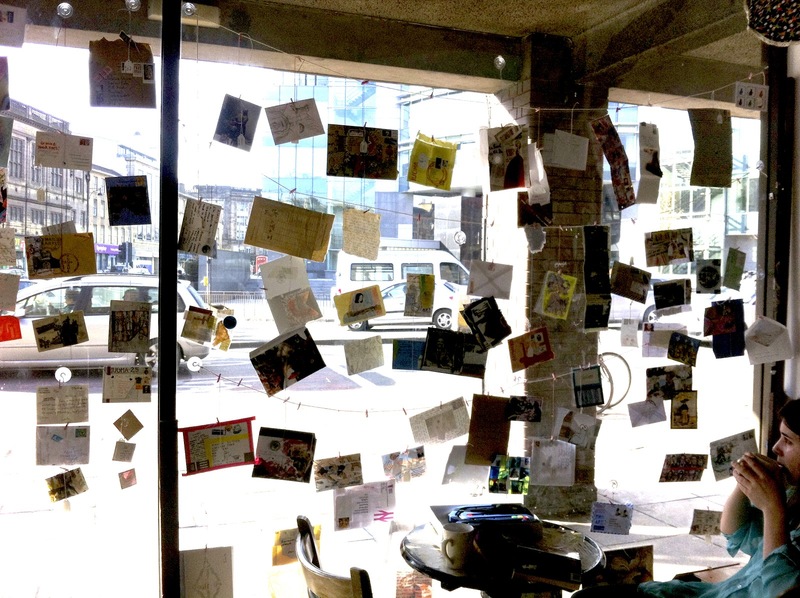 People can handle the mail art but they can also see it from the street. Yesterday when Figgy and I went to visit and check on how it was looking, we watched a few people peering in. Because we wanted to make the most of the window, we hung the pieces so some of the 'fronts' could be seen from inside while others from outside. In all we hung about 60-70 pieces. Figgy and some of her friends will 'hang out' at the cafe after lectures and will be taking it down on the 5th. When the mail art is back with me I will record exactly whose work I was able to hang in this exhibit. When I returned from Edinburgh I was greeted with more memories mail art. Brilliant! The spontaneity of the Forest exhibition has inspired me. 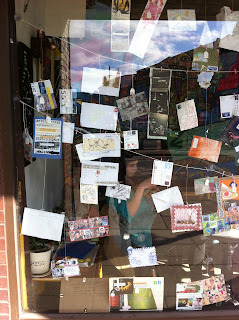 I will certainly be hanging more pop-up shows in the near future, so keep sending! Hats off to you Rebecca! Wonderful dedication to mail art. This inspires me to finish off my envelope. 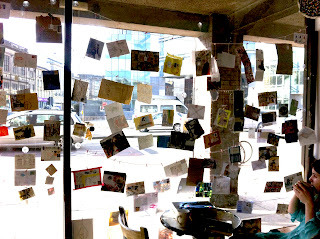 A mail-art caffe'! Looks fantastic! Marie, I hung at least one of your pieces (in trepidation lest it be unpegged), so you are there. Taidgh, your envelope has been un-loped to dangle on a string! Thank you both! Youhouuu, thank you so much!! !